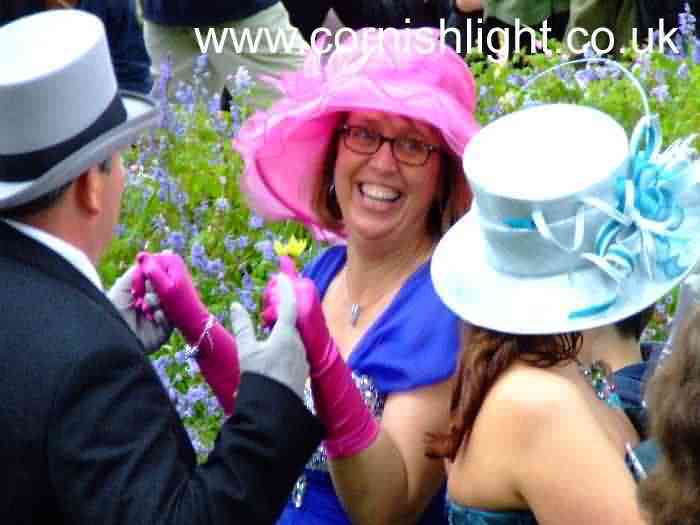 Helston Floral Day (more correctly Flora Day). One of the oldest surviving customs in the Country- a may day celebration to mark the coming of spring and the passing of winter. Its origins are thought to be in pagan times. The Principal Dance- the Furry Dance takes the form of a dignified procession, with the gentlemen wearing back morning dress, grey top hats and tails, and the ladies their finest full length dresses. For the earlier Childrens Dance the 1000+ children are all in white. Each dance is led by Helston Town Band striking up the tune of the Flora Dance. The town of Helston is emblazoned with the first greenery of spring- particularly bluebells, gorse, sycamore, laurel and hazel. The Mayday Floral Dance follows a traditional route, even passing through peoples' homes, shops and gardens. Though the whole town is crowded, particularly good views can from Penhellis Gardens. Helston is a quaint old Coinage Town in West Cornwall. And sits nestling on a hill, with its many narrow streets, intermingled with the houses with their walled gardens and interconnecting alleyways, of the wealthy of former days. The Borough of Helston is one of the oldest in the Duchy of Cornwall, a fitting place indeed for the upholding of such a lovely old custom.